The first week -though fun and wonderful- was quite stressful and hectic. We were all ready for a little break and were looking forward to visiting Pamplona that Sunday. The weather during the past days had been quite odd with temperature fluctuating throughout the day. It would rain in the mornings but the sun would shine in the afternoons. Somehow that day though, the clouds parted, the gusts slowed down, the sun greeted us with a warm embrace, and there was a light breeze; it was the perfect Sunday morning. 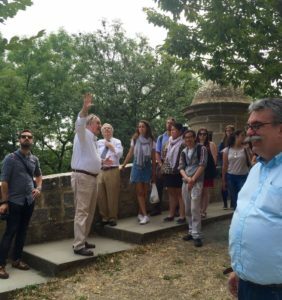 We went to Pamplona by bus; the same way we came into town earlier that week, but this time, there was much more interaction between the students. The bus got noisy for a while but nonetheless, it was nice to see everyone getting along. 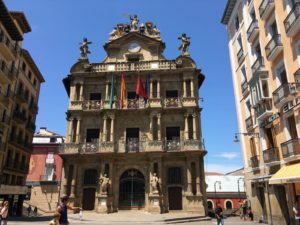 Excitement grew as we got closer to Pamplona and it was obvious everyone was ready to have fun and explore the city. Once we arrived at the outskirts, we were at awe with the majestic view as we observed the city from the top of a hill. We stayed in that spot for a while, taking pictures, excited for what was in store for us below. We were first toured around important landmarks in the city. Our first stop was the famous bull fighting ring of Pamplona that is used during the annual San Fermin Festival. Next, was the fortress used by the Romans to protect themselves from enemies. 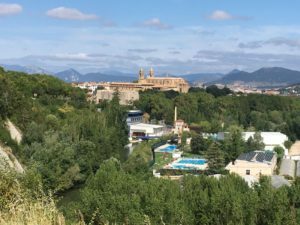 Pamplona is situated inside a valley so the mountain range surrounding the city acted as natural barriers against possible attackers. The fortress was placed at the weakest point of the valley. 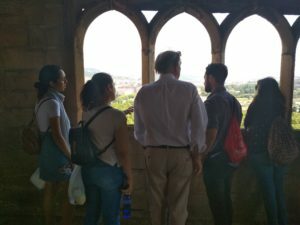 We went on to a tour inside the Catedral de Santa Maria and went up the bell tower tall enough to overlook the beautiful city. We had the best guides: Leopoldo Gil and Rafael Manzano. 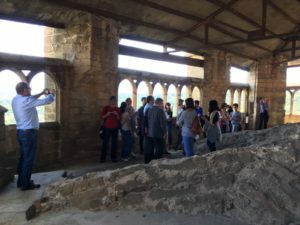 Both explained several interesting details only known by experts and people that had participated in the restoration of those monuments. After this tour, we were given a few hours to roam around the city by ourselves. It was lunch time and the group was fortunate enough to have a student local to Pamplona. She showed us spots and restaurants that only a local would know. One of them was Café Roch which still serves their famous Croquetas since 1898. Another food place specializes in patatas bravas while another specializes different kinds of dishes with Jamón. We went on to go around to check out the different places the city has to offer. The students split up into different groups. Some went to the square to get ice cream and relax. Others walked around the city to see the sights and architecture while others went to souvenir shopping. Four hours in Pamplona was not enough to take it all in. The Roman and Spanish inspired houses were quite unique. The different color schemes, details, and planning was different from other cities and towns we had visited during that week. The city and its architecture truly was a sight to see, though having new friends to enjoy the beautiful sights and stare in awe at the architecture was the best part of the trip. We met at the bus stop and went back to Amaiur to rest and prepare for the week to come.